Why visit Gdansk Poland, you may ask? Destinations in Poland are well-served from Dublin on Ryanair and Aer Lingus and Poland's Tricity in the Pomerania region is ideal for a 3-day weekend. The flight to Gdansk tends to be cheaper than to Krakow. Gdansk is more real and less touristy than Krakow. Gdansk is is teeming with history from WWII to Solidarity (just look to Westerplatte where the first shots of the war were fired when the Nazis invaded Poland). 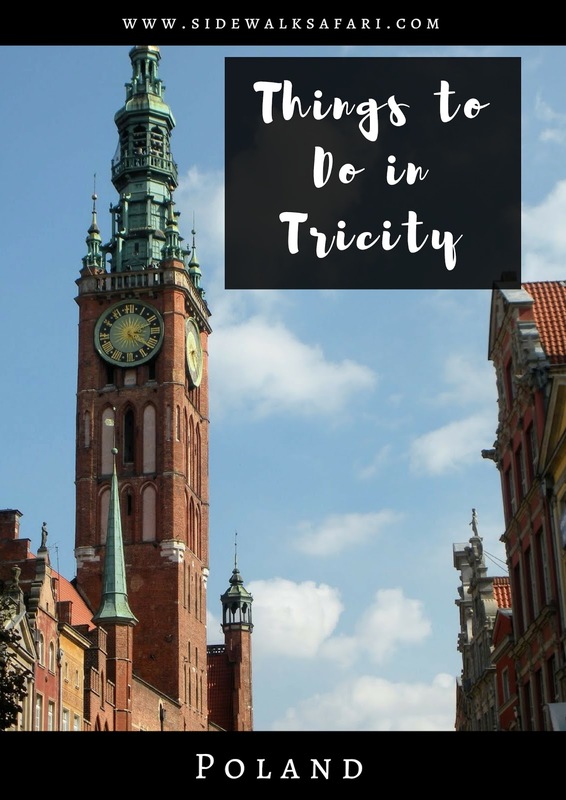 What are the key things to do in Gdansk and Tricity more broadly? Read on to learn more about how to spend an ideal non-touristy 3-days in Poland. We went directly from Gdansk airport to a local coffee shop to fuel up for the day since our flight left really early. Sweets are really popular in Gdansk. We tried a nutty, caramel-y pudding dish with our coffee. We encountered a man selling bread from a cart outside our hotel and had to try one of the pretzels he was selling. The Polish pretzel was a nice contrast to the sweets we'd tried. We also stopped at a local candy manufacturer along Długi Targ and actually got to see the craftsmen working the hot sugar to the delight of a group children looking on. We stayed at the Scandic Gdansk conveniently located across the street from Gdansk Główny Central Train Station which was quiet, clean, and very nice overall. I liked that they had a shoe-shine machine near the elevator on our floor and bicycles in the lobby making it easier to explore Tricity. Gdansk is best experienced on foot. Spend a day taking a photowalk around the city. Admire the architecture of Gdansk Główny railway station Look for impressive church edifices and archways. We passed the statue of Johannes Hevelius: astronomer, brewer, and one time mayor of Gdansk. Hevelius sits outside the Old Town Hall. Gdansk features ornate manhole covers -- a good reference point in case you forget where you are. A rapidly running canal slices the town and you can stop in the shade of a giant weeping willow along its banks like we did. Greenery spilled from the banks of the canal into the water. While taking a walk in Gdansk, keep your eyes peeled for unexpected art installations like the blue trees that we discovered on our visit. Look up as you walk around and admire the ornate decorations on various buildings. We noticed that the skleps (convenience shops) in Gdansk had an interesting style of displaying their wares. Everything was on display in a colorful, chaotic mass. The buildings of Gdansk often feature gutters encased in stone gargoyles to channel rainwater. We discovered a fountain in Gdansk surrounded by lions that would come on periodically. We found it hilarious to watch a little dog caught off guard by the dancing water as his owner looked on. Walking around Gdansk is really about experiencing a slice of life in Poland. We covered about 8 miles in a single day. Certain sculptures and imagery around Gdansk remind visitors of the war torn history of the area. We stopped by the post office and WWII memorial in Gdansk to pay our respects. One of the first battles of World War II was waged here when the Germans invaded Poland. One side of the Motława River features many ruins from World War II that were not rebuilt. The rubble stands in memory of the destruction that befell Gdansk. We stopped at the local Hala Targowa (covered market) and discovered the wonders of Polish baked goods. I practiced the couple words of Polish that we had prepared for the trip (e.g., hello = dzień dobry, pronounced jen dobre and thank you = dziękuję, pronounced jen coo ya) and the matron working at this piekarnia was very patient and tried to talk back to me very slowly in Polish. I think she appreciated my effort. Outside the covered market were a variety of produce stalls. I liked how many vendors were selling dried sunflowers. I couldn't figure out what they were used for until I looked more closely. In situ sunflower seeds to snack on! Work up an appetite and stop at Pierogarnia U Dzika for Polish pierogi and a beer. Pierogarnia U Dzika was decorated with disturbing boar heads everywhere but the meal was delicious. We soon arrived at Długi Targ (Long Market) and the ever popular Neptune fountain. Much of Gdansk was destroyed during WWII but citizens were able to hide Neptune away so that he survived the war and lived to stand before future visitors. A Medieval crane that was built in the 14th century to unload ships sits along the Motława River and is quite impressive. An imposing round tower dotted with domed windows sat beside the river. An old galleon with ornate mastheads lends to the atmosphere and takes tourists to Westerplatte where the first shots of World War II were fired. We walked along Ulica Mariacka, a popular shopping street and stopped in Cafe Kamienica. The second floor seating area was quite cozy. We wandered into a small alleyway off of Długi Targ and were surprised to find a mural. We were especially surprised to find one of the center figures wearing designer undies and standing next to a package of McDonald's French fries. Our final stop of the day was the Gdansk shipyards (Stocznia) where the Solidarity movement made its mark and cast Lech Walesa into the spotlight. In the early 1980s, Solidarity became the first independent labor union to form and make inroads in a Soviet-bloc country. 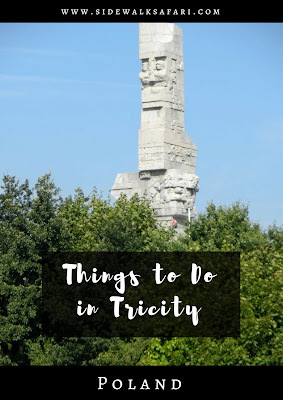 We spent the second day of our 3-days in Tricity Poland exploring Westerplatte. We headed down to the Motława River to board a pirate ship bound for Westerplatte where the Germans first attacked Poland during World War II. Along the way, we passed reminders of Gdansk's past as we sailed by the now quiet shipyards. We soon arrived in Westerplatte and made our way to the beach to look out at the Baltic Sea. The water was cold but inviting so we dipped our toes in. We walked along a nearby trail past some of the relics and memorials of World War II. We noticed that the rocks along the beach had rebar sticking out. It looked to be debris rather than material placed there deliberately -- another reminder of the senseless destruction that this area once experienced. We re-boarded our ship and passed a line of handsome and colorful tugboats. Our jaunty captain looked the part as he steered the vessel -- Argh, matie! One of the sailors broke out his guitar and serenaded us on the return voyage. From the Gdansk Główny Train Station, it is about a 15 minute ride on the local commuter train to Sopot, a Polish beach town. We walked down the main pedestrian thoroughfare toward the water. We treated ourselves to an ice cream cone (lody). Just like in Gdansk, the manhole covers in Sopot are intricately stamped with the town name. Shops and vendors ringed the area along the boardwalk. The boardwalk in Sopot is quite long (guidebooks suggest that it's more than a mile long but I think that's a bit of an exaggeration). We had to pay a modest fee (2 złoty about 0.50 USD) for the privilege of strolling along the Baltic's longest wooden boardwalk. We sat on the beach in Sopot and watched the waves lapping in gently. We returned from Sopot to Gdansk for dinner on Długi Targ. We ate outside despite a nip in the air in full view of the Neptune fountain. The polish sausage was delicious and a fantastic conclusion to our second of 3 days in Tricity Poland. On our last day in Gdansk, we visited the third component of Tricity Poland, Gdynia. Gdynia City features a large covered market near the commuter train station. They sell everything from kielbasa to clothing. We walked toward the water and passed a statue of Antoni Abraham. I didn't know this at the time, but he was the Kashubian representative to the Treaty of Versailles. It was a windy day and flags flapped in the breeze along the Baltic Sea. We passed the statue of Joseph Conrad. This is the only statue memorializing the great author and interestingly, he never visited Gdynia. We ate lunch at a local spot called Bistro Luna. We ate outside and enjoyed an inexpensive meal of pierogi and soda. The "walk/don't walk" signals in Gdynia were quite musical and we could hear them as we ate our lunch. We stopped at the covered market on our way back to the train station and bought some baked goods for the ride. There were so many kinds to choose from, each one sweeter than the last. The Polish baked goods were so sweet, in fact, that there were bees madly buzzing around the kiosk. We stopped in Oliwa, a neighborhood in Gdansk known for its gorgeous park. We spotted floating musical notes in the pond in the park. The Abbot's Palace overlooks the carefully manicured gardens. We did our best to devour the cake that we bought in Gdynia. I have to say, we didn't really make a dent. It was so tasty, but huge! We took the tram from Oliwa to Gdansk City Centre and bid our farewell to our 3 day Polish city break in Tricity before heading to Gdansk's airport for the return flight to Dublin. Is Gdansk Poland Worth Visiting? Gdansk is often overlooked by tourists in favor to Krakow, Warsaw, or even Wroclaw but we found that Gdansk is definitely worth including on a Poland itinerary. If you enjoy history and aim to experience a non-touristy slice of life in Poland, Gdansk and the broader Tricity Poland metro area is a great idea for your next weekend city break in Europe. Check out these handy maps of points of interest and our walking routes in Tricity Poland covering Gdansk, Sopot, Gdynia and Westerplatte. 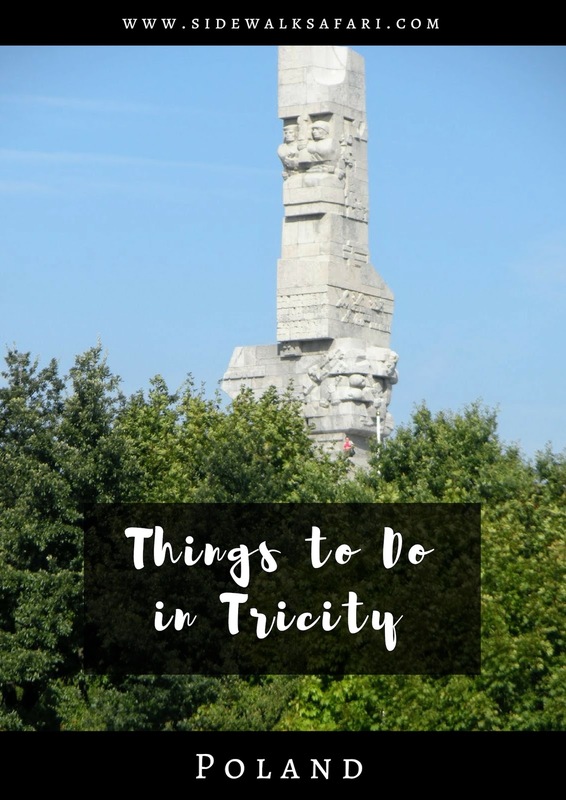 Read about Tricity Poland including Gdansk, Sopot, Gdynia and Westerplatte. Find out about things to do in Gdansk. Learn about things to do in Sopot and Gdynia City.